Mothers hold their children’s hands for a short while, but their hearts forever. Your little loved ones hand or foot prints can be taken with inkless wipes (no mess! ), then miniaturised to fit your choice of fine silver charm. 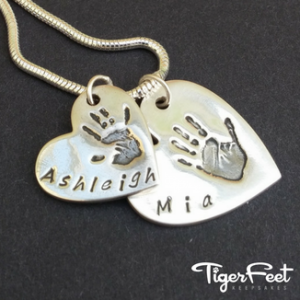 Depending on the shape and size chosen, charms can feature one or two prints. 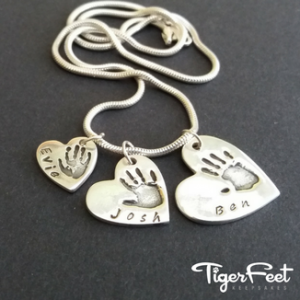 While these prints can also be taken at any age, there is nothing as sweet as cute baby feet! 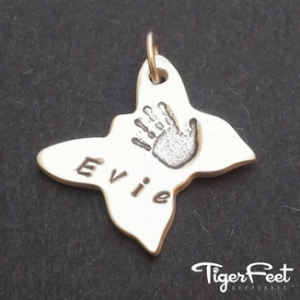 If pets are the head of your household, their paw prints can even be taken and captured in the same way on fine silver charms.